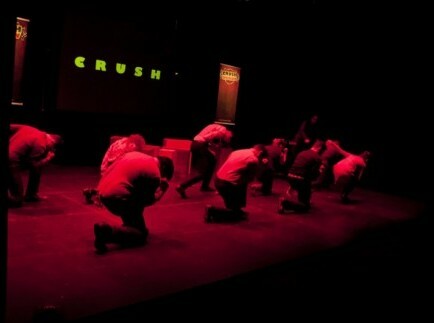 Canadian Comedy Award winning Crush Improv is Ottawa’s premiere improv company, performing in venues all over Ottawa since 2007. We have a pretty good time being professionally creative – drop us a line if you’d like to work with us! Folks at Volkswagen Canada, Redbull, Ottawa Senators, and more have chosen Crush to deliver content, train staff and entertain. In early 2007 there was a group who would sneak into any unlocked room in the uOttawa theatre building for a weekly improv jam. While performers came and went, there were five individuals who were there every week. Those five started to book gigs. So they gave themselves a name. 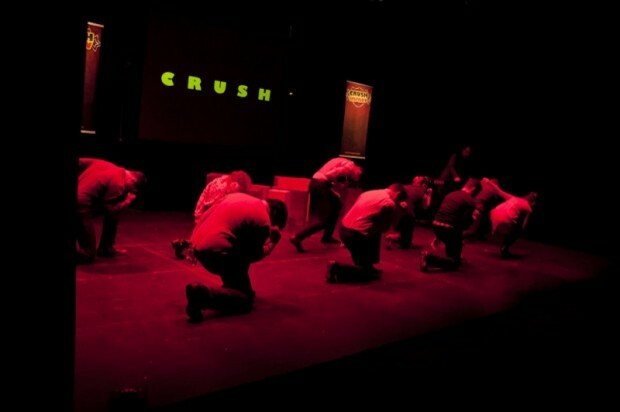 Crush Improv hit the stage for the first time in November of 2007 at Club SAW with a core cast of Brad MacNeil, AL Connors, Des Connors, Cari Leslie and David Lindsay. It wasn’t long before Crush was performing in front to packed houses at The Mercury Lounge, GoGo’s, the Black Sheep Inn and The Gladstone Theatre. They began to produce collaborative shows such as the hit Improv Awareness series and the Friday Skypetacular – where, for the first time ever, improvisers in two different cities performed as one troupe with two different live audiences. In 2008 you could go to Crush Fridays at GoGos (no longer exists). In 2009 you could go to Tuesday Make-em-ups at the Cajun Attic (no longer exists). Crush started the monthly competitive show ‘Bout Time! at the Elmdale Tavern in 2010 and it is now a staple of the Ottawa comedy scene at The Heart & Crown in the Market. AL, Brad and Cari created the show Spotlight On… (an Armando-style, monologue inspired show) for the 2011 Ottawa Fringe Festival and they took home the award for Outstanding Ensemble. Spotlight On… also enjoyed runs at Centrepointe Studio Theatre, the Gladstone Theatre and again at the 2015 Ottawa Fringe Festival. At present, the core cast consists of AL Connors, Des Warmington, Tim Anderson, Jordan Moffatt, Kristine Shadid and Dan Lajoie with musical director Glen Gower. Members in absentia include Cari Leslie (Amsterdam), Brad MacNeil (Vancouver) and Brooke Cameron (Victoria).